The whole idea behind ecommerce reporting is to build reports that showcase your company’s data, but this is worthless if you spend so much time building your report that there isn’t a second left to actually act on your data and orient your marketing strategy accordingly. This is where DashThis, our ecommerce reporting tool, comes in handy. 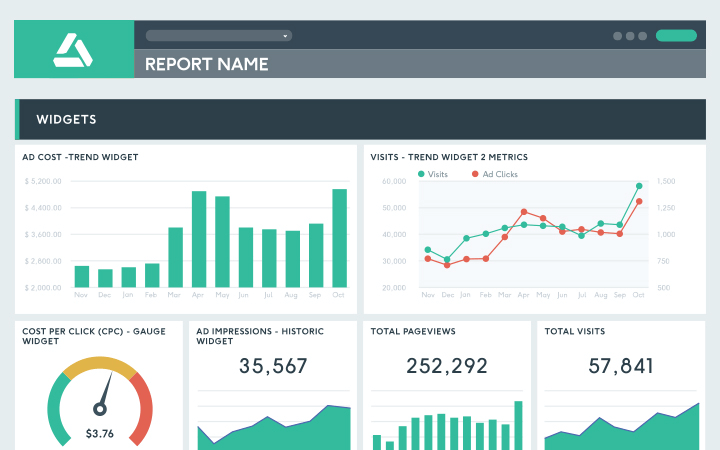 DashThis allows you to unify sales data from all your channels into a single sales report, so you can grasp at a glance how your ecommerce strategy is performing. And the good news is, it’s all automated! Don’t spend hours copying and pasting data: we take care of that for you! Let’s be honest, nobody likes a cold, impersonal report that can’t be deciphered without a magnifying glass. This is the reason why our ecommerce reporting tool isn’t just a time-saving wonder; it also creates reports that are easy to understand AND look amazing! No two clients have the exact same needs when it comes to ecommerce reporting, and this something we totally understand here at DashThis. From adding your own logo, to creating widgets from scratch, to adding images, comments, and insights, pretty much everything about your ecommerce report can be customized. Supporting over 30 integrations, DashThis allows you to connect your favourite platforms directly into our ecommerce reporting tool. Can’t find the integration you’re looking for, or need to add your own data into your dashboard? We’ve got you covered! With our CSV integration, all you have to do is plug your file into your DashThis account and find ALL your data in one place! There are a lot of ecommerce reporting tools out there, so how come DashThis manages to keep its spot as one of the best? The answer is simple: no other tool comes with such AWESOME customer service. That’s right! Here at DashThis, whether you’re on a free trial or you’re a regular client, and no matter what plan you choose, you get your own dedicated account manager. We do everything in our power to make sure your ecommerce reporting experience goes as smoothly as possible! From multiple sharing options for your ecommerce report, to password protection, to intuitive design, to multi-user support, our ecommerce reporting tool has got the necessary features to satisfy even your wildest reporting dreams! Paying for things you don’t need? No thanks! Our pricing model is based on paying for the number of dashboards you intend on using. Regardless of the plan you choose, everything else is included: unlimited number of users in your account, your very own dedicated account manager, and a whole lotta fun! What’s an ecommerce reporting tool without white label options? Trust one of our stellar designers with a design that completely reflects your brand’s overall vibe. Setting up an ecommerce strategy takes time and energy, so it goes without saying you need to report your results in order to see how that strategy is working for you. However, figuring out which of all the KPIs to keep track of can seem like a tedious task of its own. This is why we’ve created an ecommerce report template with all the basic KPIs you need to save you tons of time. You’re welcome! Read our blog for more ecommerce reporting content! Are you as passionate about ecommerce reporting as we are? Then our blog is where you want to be right now! Also, why don’t you subscribe to our newsletter while you’re at it? It’s worth it, we promise!